As President Xi Jinping starts his tour of Africa, media in China dismiss concerns over "colonialism" and exploitation on the continent. Xi Jinping's visits to Russian defence sites and his talks with Russian Prime Minister Dmitry Medvedev on Saturday, followed by his arrival in Tanzania, are the lead stories on China Central Television, People's Daily and other major media outlets. 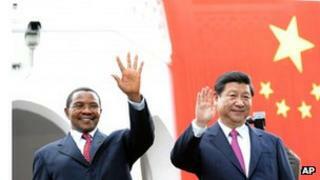 Guangzhou-based 21st Century Business Herald says a key highlight of Mr Xi's visit is China helping Tanzania build a port connecting the African country to Chinese, Middle Eastern and European markets. Referring to the port project, Xu Guangyu, senior adviser of the China Arms Control Association, tells Hong Kong's Ming Pao that the Chinese navy will need to set up supply bases as it ventures further out in the world in future. Antony Wong Dong, a Macau-based Chinese military watcher, also tells Ming Pao that China is likely to wait for a period of time before letting naval ships dock at the port to allay concerns about Chinese military expansion in the Indian Ocean. Global Times hits back at a Financial Times article by Nigerian central bank governor Lamido Sanusi calling on African countries to "wake up to the realities of their romance with China" and see China as a competitor capable of colonial-era exploitative practices. "His article is full of loopholes, but it also reminds us that public opinion surrounding China-Africa relations environment has become increasingly complex," the newspaper comments. Besides financial aid in return for energy and resources, China should do more to help African economies to develop independently, it adds. In Outlook magazine, Prof Mei Xinyu, a researcher at commerce ministry think-tank, calls Mr Sanusi's logic "absurd". He points out that Chinese companies would be less likely to import equipment and staff if Africa was able to deliver on technology, reasonable costs, quality, service, adequate technology and equipment, and a skilled labour force. Rounding up Mr Xi's visit to Russia that ended on Sunday, China Daily says the relationship between the two countries is "now in its best shape for years" and that Beijing regards ties with Moscow as a "priority" for its diplomacy. In response to international concerns over Beijing and Moscow aligning as a strategic axis, Xinhua news agency says China and Russia have independent foreign policies and suspicions over their co-operation are "ill-grounded and completely unnecessary". "Beijing never seeks to foster a strategic partnership with Moscow at the expense of ties with any other country, but it has zero tolerance if its core interests are infringed, just as Moscow does," the agency stresses. Xinhua welcomes a "significant breakthrough" reached between Russian natural gas giant Gazprom and China National Petroleum Corp on Russia providing 38bn cu m of natural gas to China per year starting 2018. "Pricing disagreements" lasting over a decade resulted in repeated delays to the pipeline project. Before Mr Xi headed for Moscow, China signed framework agreements with Russia to buy the latest 24 Su-35 fourth-generation fighter jets that are "the closest to being fifth-generation", China Central Television reports. China will also commission four jointly-built diesel-electric super-quiet submarines. The submarines will be designed by the Chinese navy and two will be built in Russia and the other two in China, CCTV adds. Following international media reports that the Chinese navy will join US-led Rim of the Pacific multinational naval drills next year, Oriental Morning Post says the Chinese military has not yet officially confirmed the news. A team of Chinese observers went to Rimpac in 1998, but media reacted angrily last year when Beijing was not invited to attend the Rimpac drill around Hawaii, which included navies from Japan, Russia and India. Controversy over electoral reform has flared up again in Hong Kong after National People's Congress law committee chairman Qiao Xiaoyang cited a three-stage test that could disqualify any candidate of the "opposition camp" who "confronts" the central government from running for chief executive in 2017, Oriental Daily News reports. "Firstly, the nomination committee will decide. Then the voters in Hong Kong will decide. Lastly, the central government will decide whether to appoint [the candidate] or not," South China Morning Post quoted Mr Qiao as telling pro-establishment lawmakers in Shenzhen at a closed-door seminar yesterday. Beijing-backed newspapers Wen Wei Po and Ta Kung Pao say Mr Qiao's remarks were an insurmountable "bottom line" directed at the opposition camp and "Western anti-China forces" not to disrupt Hong Kong's electoral process. Independent daily Ming Pao says most Hong Kong residents are not against the central government's patriotism requirements for the chief executive, but they object to pre-election political screening. It calls on the government to start its planned public consultations on electoral reform as soon as possible to avoid tensions escalating. Apple Daily, an outspoken critic of the communist party, accuses Mr Qiao and other central government officials of "wantonly interfering" in Hong Kong affairs.